Welcome back! Harbour Pool will re-open February 1! There are still spots in our swimming programs! Register today! There are plenty of spaces available in Harbour Pool’s Preschool Plunge and Play programs! This 2 ½ hour program offers a craft, one hour of pool time and a snack, all under instructor supervision. Check out the February and March Swim Schedule now at fortsask.ca/pool. Shoppers Drug Mart at 100 Westpark Blvd now sells transit passes and tickets! 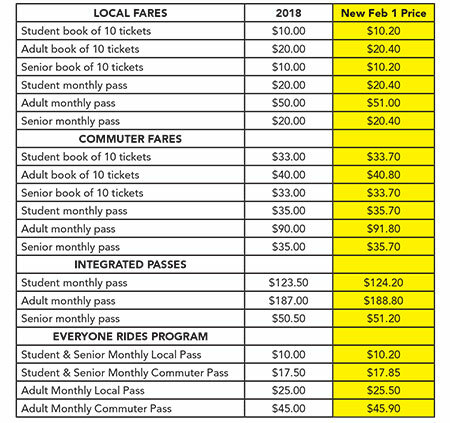 Everyone Rides, the new low-income transit subsidy program, offers a 50% discount off transit passes to those who qualify. Pass sales for this program begin January 1, 2019 at the Dow Centennial Centre and City Hall. Riders must first register before purchasing their pass. Forms can be downloaded at fortsask.ca/everyoneplays or can be found at City Hall, Dow Centennial Centre or Harbour Pool. 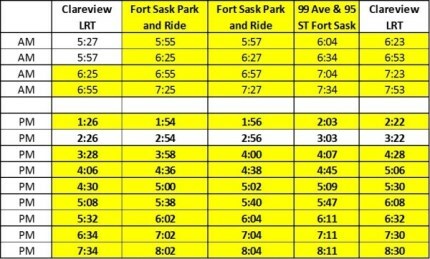 Some Route 580 departure times will be adjusted by 2 minutes beginning February 1st, 2019 to improve LRT connections. The times highlighted in yellow are those affected. Never pass a snowplow on the right hand side unless the operator stops or slows down and signals you to pass. Be careful and keep a safe distance (30 metres) from any snowplow, grader or truck and loader during snow removal. Observe the signs posted or follow the directions of the crew. Free Workshop - Registration required as there is limited space. A workshop offered by Fort Saskatchewan Family and Community Support Services. Facilitated by Lori-Ann Huot, Founder & Director of Hope & Healing Grief Support Services and Program Coordinator of Bereavement Services with Fort Saskatchewan Families First Society. Register for programs or classes, sign up to volunteer at cultural events, and learn about community organizations. Pick up your copy at the Public Works Building, City Hall, Dow Centennial Centre and the Golf and Curling Club. Never flip a calendar again! Download the ‘Fort Sask Waste’ App for personalized collection calendars, weekly pick-up reminders and sorting at your fingertips. For more information and a complete listing of all open competitions, please visit fortsask.ca/careers.